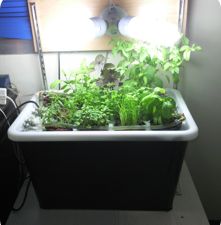 I developed interest in hydroponics when I saw an Aerogarden unit at my cousin’s house. As a result, I ordered Aerogarden PRO100 unit from amazon and had it shipped to Kuwait via Aramex. After using the Italian herb seed package, I fell in love with it so I started reading about how the hydroponic system worked. After doing a lot of reading and buying the necessarily equipment and parts, I decided to create my home-made hydroponic system. I called it, Hydroponic Version 1.0 (see picture below) because later I upgraded the system to avoid some drawbacks. I bought Ikea plastic box and drilled to make holes and then used a cutter to cut the plastic to make circle. I also bought an oxygen pump from a local fish pet shop, and a mechanical timer for the oxygen pump. I didn’t set up any lights because I thought the lights from my Aerogarden unit would be enough. I used to water the plants manually during the initial phase. Some seeds spouted and developed roots and managed to feed themselves from the water resevoir under it. The medium was coir mulch and the seeds were from Aerogarden Herb Chef pack along with its nutrients. After using it for a couple of weeks, I noticed the water turned red because of the coir mulch so I decided to upgrade the unit to larger and better one. 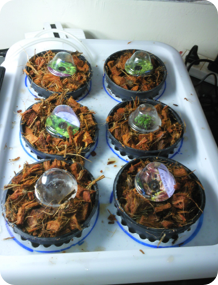 The new unit fit 12 herb plants (I transferred the six plants from the first version and added 6 more), the medium was changed to clay pebbles, bought a water pump, plastics hoses, set my own lighting system and finally added another mechanical timer for the lights. I set the mechanical timer so that the water pump & oxygen would work for a total of 8 hours (2 hours off and 2 hours on, etc) and the lights would work for a total of 16 hours a day. The plants grew wonderfully and I managed to harvest 2-3 months of herbs until my mechanical timers kept falling a part. I replaced the timers three times but then finally, I got fed up because all of the mechanical timers I bought were crap and I couldn’t find a quality timer. I ended up transferring my plants to pots and left them outdoors in our garden. Dear Dalia, myself from India working in Kuwait. Got interested in hydorponics recently & was searching web for info. Surprised & happy to find some one in Kuwait doing this wonderful farming. Can I get any books here on Hydoponics? There is a bookshop in Muthana Complex. You might find books there but I suggest ordering them online from amazon.